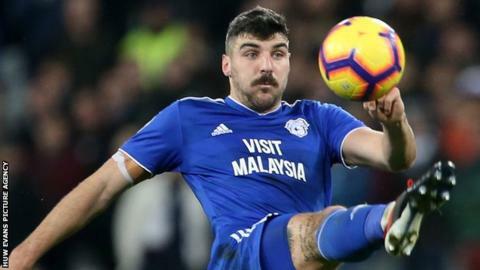 Cardiff City's Callum Paterson will miss the rest of the season because of an ankle injury. The 24-year-old, who can play as a defender, midfielder or striker, damaged his ankle during the first half of Scotland's Euro 2020 qualifying win over San Marino. He will have surgery on Monday. "He should be out until pre-season - a big blow," said Cardiff manager Neil Warnock. "It's no good saying it's not a blow. Contrary to what was said before the Scottish game [3-0 loss in Kazakhstan], I never said anything to Alex [McLeish, Scotland's manager] about him not playing on the plastic pitch. "But he had such a bad [previous] injury with his knee, I think they spoke between themselves. The second game [against San Marino] was a disaster for us, but it's one of those things." Cardiff have already lost centre-back Sol Bamba for the remainder of the campaign after the Ivorian damaged knee ligaments in the defeat at Wolves earlier this month. Warnock also revealed the Bluebirds will now be without another defender, Matt Connolly, although he has only made one appearance this season. "Connolly was just coming back to training and he dislocated his ankle," the Bluebirds boss said. "Sol Bamba's operation has been a success and the surgeon is delighted about that. Sol is in Barcelona at the minute, recovering well." A combination of their match against Brighton being rescheduled and international fixtures mean Cardiff have not played since their 2-0 win over West Ham on 9 March. They return to action with a daunting double-header, with a home match against Chelsea on Sunday followed by a trip to Premier League champions Manchester City on Wednesday. The two matches could have a major bearing on the Bluebirds' hopes of avoiding relegation, as they are currently two points adrift of safety. Warnock is concerned about the match fitness of Iceland midfielder Aron Gunnarsson, who has been hampered with injuries this season and is someone who the Cardiff manager had hoped would have some form of rest during the international period. But the 29-year-old, who will join Qatari side Al-Arabi in the summer, played 63 minutes of Iceland's Euro 2020 qualifying win in Andorra and then the full 90 minutes of a 4-0 defeat in France. "With Iceland I was disappointed. I was originally told Aron wasn't going to play on the plastic pitch for the first game then he played for over an hour, and then he plays for 93 minutes against France," said Warnock. "I can't understand that at all. I know it's a new manager and you want to do well, but when you're 3-0 down, surely you can substitute a player? "I bent over backwards for Iceland last season to allow him to go the World Cup and he had three months this season when he was out and we had to build him back up. I was disappointed with the Iceland manager and I'll be speaking to him. "That doesn't matter now as Aron is leaving at the end of the season. "But we've been treating him, he's not played two games and all of a sudden we've got Chelsea and Man City in the space of three days. "I just thought it was pure selfishness and I'm so disappointed in Iceland for doing that."